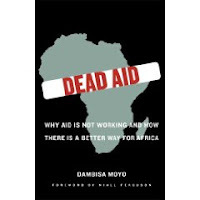 When the media blitz started a couple months ago for Dambisa Moyo's book "Dead Aid," I admit it caught my attention however not being an economist, or in development or comfortable with the thought of the world's poorest suddenly flailing without any aid, my interest in Moyo's book waned. Until yesterday. Yesterday, I went to see Dr. Josh Ruxin speak on his efforts and experiences in Rwanda. Ruxin is an Assistant Clinical Professor at Columbia University, Founder and Director of the Access Project which focuses on increasing access and affordability to health care for the poor; he is the founder of Rwanda Works which invests in improving health and fostering wealth creation; and he runs Millennium Villages which promotes community led development to lift communities out of extreme poverty with the hopes of achieving the UN's Millennium development goals. Dr. Ruxin is also a very effective one man PR machine for Rwanda, which is presently his country of residence. In his presentation, he touted that Rwanda had made mind boggling advances in public health care over the past 15 years. Infrastructure has been built up. Wireless technology is available. Roads have been paved connecting Kigali to more rural areas. And while Paul Collier's book "The Bottom Billion" suggests that it takes several decades for a country once mired in conflict to rise out of it - Rwanda is defying expectations. In his talk, Ruxin indicated that what was ultimately needed to once and for all to defeat poverty in Rwanda and to counter the handicap of being a landlocked country was investment in the private sector. Being a tourist, he said, would do more for the country then development aid, he argued. And when I went up to him to talk after his presentation, he added that Moyo has a valid arguement. Aid to support immunization, mosquito nets, HIV antiretroviral drugs are obviously critical on a human level but they are not enough to help a country build wealth long term. Since I am a complete and utter novice in the world of aid and assistance, (my interest in this is more as concerned global citizen), I spent the better part of today researching Moyo's thesis and the counter-arguments of some of her very vocal critics to get a better understanding. Moyo argues that foreign direct assistance to African governments, primarily coming from the west, have propped up corrupt leaders, making these politicians more beholden to their foreign donors than their own constituents. She contends that aid to Africa has made the poor poorer and more dependent. Over the past 60 years, Moyo writes that at least $1 trillion of development related aid has been sent from rich countries to Africa and yet the per capita income today is lower than it was in the 1970s. (Ruxin also added that life spans were also longer in 1970's - as health and wealth are in direct correlation). Today in Africa, more than 350 million people live in complete destitution on less than $1 a day. For Moyo, the most obvious argument against aid is the strong links to rampant corruption in Africa. Moyo states that in 2002, the African Union estimated that corruption was costing the continent close to $150 billion a year. This form of free money, she argues provides corrupt leaders with no incentive to be otherwise. It does not promote accountability or transparency, both critical to a nascent or burgeoning economy. And no country in the world ever developed their economy with a complete reliance on hand-outs. While she insists that she is only critical of government to government aid and not emergency and charity based aid, she is also harshly critical of celebrities like Bono who have made Africa their mission. These celebrities she claims perpetuate a negative stereotype of Africa - one of pity, poverty, war and famine. Once implanted in the psyche of an African child, it makes it that much harder from the child to rise above his/her plight or imagine that they are destined for anything more. As an alternate strategy, Moyo promotes bond issues, trade and foreign investment as a means to financial freedom and better government. She claims that her work at Goldman Sachs demonstrated to her that this was a viable and smarter alternative. Her most controversial proposal however, which is getting the most criticism, is to cease all aid to Africa within the next 5 years. This coming at a time when Jeffrey Sachs is calling for more aid for sub-Saharan Africa. The release of Moyo's book has perhaps come at a somewhat inopportune time for her and her argument. The current global economic crisis has provided a rare glimpse into what could happen if aid to Africa would suddenly cease. With a decline in the prices of commodity exports, a decline in the demand for services, a decline in foreign direct investments and a decline in overseas development assistance, African countries with poor governance and weak state institutions are being hit extra hard. And as a result, there are numerous humanitarian and development concerns that are arising from this crisis. For countries with low reserves, they may soon be unable to import basic necessities like food, fuel and medicine. Rising unemployment and decelerating remittances are putting tremendous strain on poor households. And with inadequate income for food and other life necessities, rising malnutrition will increase susceptibility to disease and illness. Not only would infant deaths increase, many children would drop out of school too weak to attend or unable to pay fees. This in turn could potentially increase social and political instability. It therefore, seems apparent to me that the answer obviously is not a cessation of aid but smarter aid and a demand for greater transparency and accountability. Aid should not only include foreign direct investment, as Moyo has suggested but also guidance and support in building institutions, promoting education and entrepreneurships and educational and cultural exchanges. Coming out of conflict and genocide, many of these countries lack the proper institutions to support and promote equal opportunities and wealth creation. In the case of Rwanda, improvements in healthcare have allowed people to focus less on survival and more on income generation. However, despite the best of intentions there are barriers. What Ruxin struggles with in Rwanda in trying to help build a more successful and prosperous society is the lack of education, management knowledge, a sense of entrepreneurship - to build something from scratch to generate that bigger income. Rwandan society is also used to a very top down structure and that is going to take time to change. And undoubtedly the genocide wiped out thousands of extremely capable possibly entrepreneurial people. While he supports Moyo's proposal for more microfinance investments, he insists that is not enough for a place like Rwanda. Such a system may have worked for countries in Asia, however differences in culture, and a lack of trust and cooperation resulting from extreme poverty and conflict prevent this from taking hold in some countries like Rwanda. Additionally Ruxin adds, how many multi-million dollar companies grew out of microfinance projects with a 30% to 40% interest rate? If someone through microfinance increases their income from $1 a day to $2 a day is that enough? Ruxin supports Paul Kagame's efforts to bring in industry giants like Google and entrepreneurs, industry experts and management gurus like Michael Porter to Rwanda. He also promotes internships and exchanges for Rwandan students to foreign companies and universities. He is also on the board of Orphans of Rwanda which offers financing for university education for young Rwandans who have been orphaned either through war or HIV or other unfortunate circumstances so that they can in turn become leaders in driving economic development. Investment in education is key. Banks in Rwanda he says have capital, just not enough ideas and entrepreneurs to offer loans. So his hope through all his various efforts and organizations is to create an environment that educates, nurtures and supports entrepreneurship alongside building a sound healthcare system. The country of Rwanda is using Singapore as their model. Singapore once no more than a rocky outpost with very little if any natural resources built itself up into a global powerhouse. Singapore has good universities and a very educated population; Singapore enjoys good governance, no corruption and an enviable business environment. Singapore is also the model for many countries in the Gulf. If Rwanda is able to continue on its present trajectory, it might just become the Singapore of Sub-Saharan Africa. And then Rwanda could become the model and inspiration for its own continent to finally turn around.